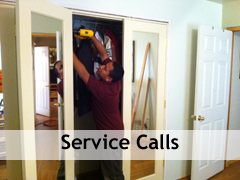 We offer a variety of door related repairs and services for your convenience. With 30 years of being in the door business, we have the knowledge and expertise to take care of virtually all of your door needs. Click here to contact us to schedule an appointment or request a quote. Our installers specialize in doors, so you can trust that they have the knowledge and experience to get the job done right. 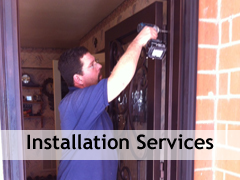 We install doors, pre-hung units, sidelites, transoms, hardware and virtually any door-related install. 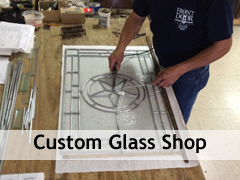 Whether you are looking for a leaded glass insert to provide privacy or add a touch of elegance to your home, our skilled glass artists are capable of making nearly any design imaginable. Do you have a door that’s sticking or not functioning properly? Is your weatherstripping worn out? We can help. Our experienced team of installers have the skills and expertise to take care of virtually all your door needs. 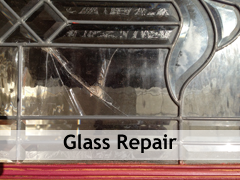 We provide on-site glass repair work for most residential doors. Our extensive selection of glass textures and ability to bevel glass enables us to repair or replace most types of glass in your door, sidelite, or transom. 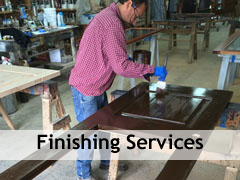 Our skilled and experienced in house finishers use the highest quality materials and techniques to ensure a long lasting and beautiful finish.